Our next Court of Honor is Monday, April 22. Join us in the Mt. 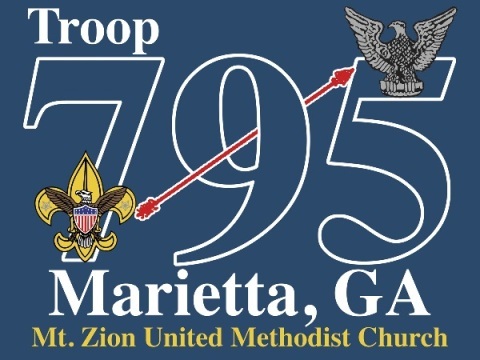 Zion sanctuary as we honor our scouts who have advanced in rank or earned a merit badge. This is a Class 'A' function and there will be refreshments in the lodge afterwards. Our May camp out will be the great Space X camp out of 2019. We will be at Hard Labor Creek State Park working on the Space Exploration Merit Badge. If possible rockets will be built and launched. There are slots available for NYLT this year. Three Summer sessions, one just before Thanksgiving and one just after Christmas. The summer sessions are May 26, 2019 - May 31, 2019, June 2, 2019 - June 7, 2019 and June 9, 2019 - June 14, 2019. We have another chance to help our sponsor, Mt. Zion Methodist Church. They have requested our assistance loading unusable metal items into a trailer to be hauled off for re-cycling. This should be a 2-hour project. Join us in the Mt. Zion pumpkin patch at 9:30 AM, Bring gloves and a water bottle. Class 'B'. Meet at the corner of Lassiter and Johnson Ferry Road. We will walk down Johnson Ferry to Oak Lane, picking up trash for Keep Cobb Beautiful. We should be done around 9:00 AM, and scouts can be picked up at the Fire Station parking lot.